A molecule is a combination of two or more atoms held together by covalent bonds. Molecules are the smallest units of compounds that display their identifying properties. Molecules can be composed of two or more atoms of the same element (such as N2 and O2) or may be composed of atoms of different elements, as in CO2 (carbon dioxide), SOCl2 (thionyl chloride), and C6H5CHO (benzaldehyde). Because reactions usually involve a very large number of molecules—far too many to count individually—we usually measure amounts of compounds in terms of moles or grams, using molar mass to interconvert between these units. Ionic compounds do not form true molecules because of the way in which the oppositely charged ions arrange themselves in the solid state. As solids, they can be considered as nearly infinite three-dimensional arrays of the charged particles that comprise the compound. As described in Chapter 3 of MCAT General Chemistry Review, solid NaCl is a coordinated lattice in which each of the Na+ ions is surrounded by Cl– ions and each of the Cl– ions is surrounded by Na+ ions. This makes it rather difficult to clearly define a sodium chloride molecule, and the term formula unit, representing the empirical formula of the compound, is used instead. Because no molecule actually exists, molecular weight becomes meaningless, and the term formula weight is used instead. Ionic compounds form from combinations of elements with large electronegativity differences, such as sodium and chlorine. Molecular compounds form from elements of similar electronegativity, such as carbon with oxygen. The difference between ionic and covalent bonds is discussed in Chapter 3 of MCAT General Chemistry Review. Remember that the term atomic weight is a misnomer because it is actually a weighted average of the masses of the naturally occurring isotopes of an element, not their weights. The same applies here to our discussion of molecular weight. Molecular weight, then, is simply the sum of the atomic weights of all the atoms in a molecule, and its units are atomic mass units (amu) per molecule. Similarly, the formula weight of an ionic compound is found by adding up the atomic weights of the constituent ions according to its empirical formula, and its units are also amu per molecule. What is the molecular weight of SOCl2? To find the molecular weight of SOCl2, add together the atomic weights of each of the atoms. Remember that Avogadro’s number (and the mole) are just units of convenience, like the dozen is a convenient unit for eggs. This equation is often used in stoichiometry and titration problems. How many moles are in 9.53 g of MgCl2? First, find the molar mass of MgCl2. Now, solve for the number of moles. Equivalent weight and the related concept of equivalents are a source of confusion for many students. Part of the problem may be the context in which equivalents and equivalent weights are usually discussed: acid–base reactions, oxidation–reduction reactions, and precipitation reactions, all three of which can be sources of confusion and anxiety on their own. Therefore, let’s start with a more basic discussion of equivalents. Often, certain elements or compounds can act more potently than others in performing certain reactions. For example, one mole of HCl has the ability to donate one mole of hydrogen ions (H+) in solution, but one mole of H2SO4 has the ability to donate two moles of hydrogen ions, and one mole of H3PO4 has the ability to donate three moles of hydrogen ions. To gather one mole of hydrogen ions for a particular acid–base reaction, we could use one mole of HCl, a half-mole of H2SO4, or one-third of a mole of H3PO4. Or, consider the difference between Na and Mg: One mole of sodium has the ability to donate one mole of electrons, while one mole of magnesium has the ability to donate two moles of electrons. This provides context for the concept of equivalents: How many moles of the thing we are interested in (protons, hydroxide ions, electrons, or ions) will one mole of a given compound produce? Sodium will donate one mole of electrons (one equivalent), but magnesium will donate two moles of electrons (two equivalents). The idea of equivalents is related to the concept of normality, which is explained in the discussion of acids and bases in Chapter 10 of MCAT General Chemistry Review. where n is the number of particles of interest produced or consumed per molecule of the compound in the reaction. For example, one would need 31 grams of H2CO3 ) to produce one equivalent of hydrogen ions because each molecule of H2CO3 can donate two hydrogen ions (n = 2). Simply put, the equivalent weight of a compound is the mass that provides one mole of the particle of interest. Whenever confronting a stoichiometry problem, always look for normality by identifying an equivalent unit (protons, hydroxide ions, electrons, ions) and then multiplying it by the number of moles or molar concentration to find the normal concentration. where n is the number of protons, hydroxide ions, electrons, or ions produced or consumed by the solute. 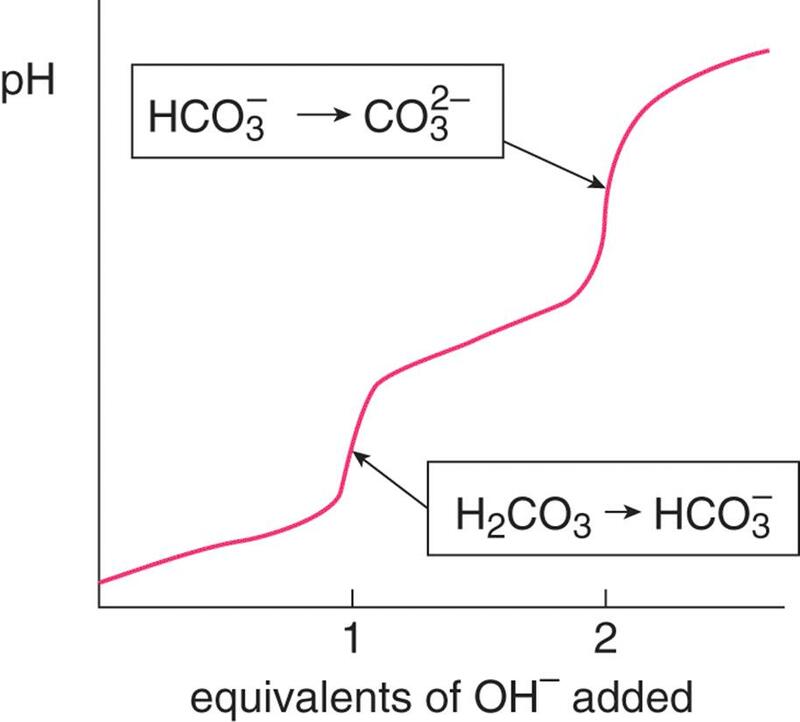 Figure 4.1 shows the titration of the diprotic acid H2CO3 with a base. The x-axis indicates that two equivalents of base are needed to neutralize both protons of this acid. Figure 4.1. Titration of Carbonic Acid with a Base Carbonic acid is diprotic, so two equivalents of base are required to neutralize both protons of the acid. There is a real benefit to working with equivalents and normality because it allows a direct comparison of the quantities of the entity we are most interested in. In an acid–base reaction, we care about the hydrogen or hydroxide ions; where the ions come from is not really the primary concern. It is convenient to be able to say that one equivalent of acid (hydrogen ions) will neutralize one equivalent of base (hydroxide ions), but the same could not necessarily be said if we were dealing with moles of acidic compounds and moles of basic compounds. For example, one mole of HCl will not completely neutralize one mole of Ca(OH)2 because one mole of HCl will donate one equivalent of acid, but Ca(OH)2 will donate two equivalents of base. What is the gram equivalent weight of sulfuric acid? First, find the molar mass of H2SO4. Next, identify the equivalents: protons (H+), because these are transferred in acid–base reactions. The number of protons in sulfuric acid (n) is 2. Now, calculate the gram equivalent weight. In acid–base chemistry, the gram equivalent weight of an acid represents the mass that yields one mole of protons, or one mole of hydroxide ions if a base. What is the normality of a 2 M Mg(OH)2 solution? First, identify the number of equivalents (n). There are two hydroxide ions (OH–), which is the most likely equivalent of interest because magnesium hydroxide is a base. 3. How do the number of molecules in 18 g of H2O compare to the number of formula units in 58.5 g of NaCl?